Alexander The Great Beach Hotel was built on an archaeological site with tombs in the grounds, this impressive hotel offers superb views of the harbour across the bay. Located on a sandy beach with many shops, bars, restaurants and taverns within a few minutes walk. Elegance, style and service combined with numerous facilities will ensure your stay at the Alexander The Great Beach Hotel is enjoyable and relaxing. This hotel was renovated and refurbished during winter 2002/2003 and has been awarded the EU Blue Flag award for clean beaches. This hotel is a member of Kanika Hotels Limited. 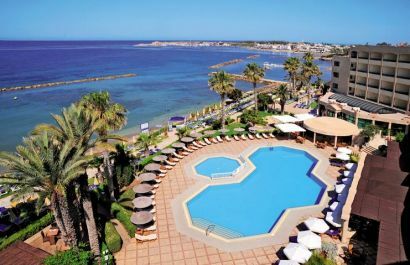 "Nice Hotel Within A 10 Minute Walk Of Paphos"
Nice hotel within a 10 minute walk of Paphos harbour, shops and restaurants. The hotel is on the sea front with a small sandy beach. The beach is ok but nothing special. The hotel rooms are comfortable and kept clean. However no tea or coffee making facilities in the room. If you want this the cost is 3 Euro per day. Pay for a sea view room otherwise you overlook the car park and street to the front of the hotel. Lots of food choices at breakfast and snacks/dinner very nice. The Hotel is very focussed on customer service and staff very helpful and polite. Also very well organised. Sun beds are allocated to you on arrival and remain yours for the duration of the holiday; however there isn't vast amounts of outdoor space and the outdoor pool is fairly small. Public areas inside the hotel are very nice and plenty of space to sit and have a quiet drink should you require it. Steam room, sauna and gym are fine only drawback is the size of the pool/outdoor areas, especially as the beach is small and not the best. Hotel is ideally situated as it is far enough away from the town if you want quiet but within walking distance should you require it. "Great Hotel Lovely And Clean"
Just got back from this hotel on weds 6 August 2 weeks break. Great hotel lovely and clean, pay extra for sea view it is breathtaking and much quieter than whacky races road at the front. Great pub/cafe across hotel called "The White Hart", good food and drinks, for breakfast if u miss it, go to "Montys" just across from hotel, best in Cyprus we thought! Word of warning, the airport is a nightmare red hot, be warned. All in all great hols will we go back? Yes but not July or August, it was far too hot for us, but don't be put off if you like hot, also not the cheapest place ever been to we found it quite expensive, see what you think if you go. Enjoy if you have booked, if your thinking of booking this hotel, it is great you won't be disappointed. "The Sunbed Allocated System Is Brilliant"
I stayed for a week here with my husband and 8 year old daughter in June 2005 and found it to be a lovely, clean hotel with lots of facilities.We chose the bed and breakfast option but ended up eating in the hotel most nights as the food was so nice, especially the barbeque night. The sunbed allocated system is brilliant - you see the pool guy on your first day and choose where you would like your sunbeds to be for the duration of the holiday. All drinks and snacks can be charged to your room so no need to carry cash about. Ask for a sea view room as it is a lovely sight to wake up to in the morning. The indoor pool is handy when the sun gets too hot in the middle of the day for a cool down. We liked it so much we are going again this year.